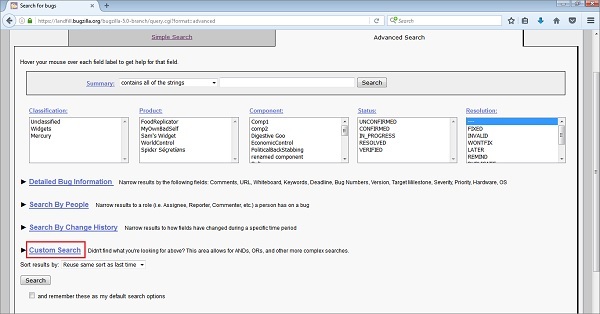 Custom Search is an extended feature of the Advanced Search. It works on the principle of – “Did not find what you are looking for above? I.e. in advanced search”. This area allows words like AND, OR, and other more complex searches. Navigation of custom search is as follows: Search → Advanced Search → Go Down and click on Custom Search as depicted in the following screenshot. Custom Search compares a selected field with a defined operator for a specified value. It is possible that too much of this could be reproduced using the standard fields in an Advanced Search option. However, the user can combine options like "Match ANY" or "Match ALL", using parentheses for combining and priority to construct searches of complex queries. Field − The name of the field being searched. Operator − The comparison operator. Value − The value to which the field is being compared. The list of the available fields contains all the fields defined for a bug. It includes any custom fields, as well as some other fields like the Assignee Real Name, Days since Bug Changed, Time since Assignee Touched and other things, which might be useful to search further. There is a wide range of operators available. There are various string-matching operations (including regular expressions), numerical comparisons (which also work for dates) and to search for change information of a bug. When a field changed, what it changed from or to, and who did it. There are special operators is empty and is not empty, because Bugzilla cannot tell the difference between a value field left blank on purpose and one left blank by accident. The user can have n number of rows to define operators, values and fields. There is a dropdown box above them, which defines how these rows are related with the search. Under the “match all of the following separately”, the search would return bugs, where a "Bug" appeared in one comment can be an "issue" in the same or any other comment. Under the “match all of the following against the same field”, both strings would need to occur in exactly the same comment, i.e. it will select a bug having both Bug and issue words in the same comment. By clicking on Show Advanced features, more capabilities or features appear to use complex and specific search. The user can negate any row by checking a checkbox. It can also group lines of the search with parentheses to determine how different search terms are related. The user gets the choice of combining them using ALL (i.e. AND) or ANY (i.e. OR).